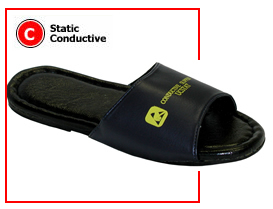 This comfortable, conductive slipper is ideal for situations where foot/heel straps are inconvenient and the workload demands several hours of standing. The Cleanroom Lint-Free Shoes are ideal for high-tech environments where long hours and intensive attention to detail are a must. A comfortable shoe plays a very important role in a working environment. Poor design along with long hours will cause discomfort to the worker, resulting in poor productivity. 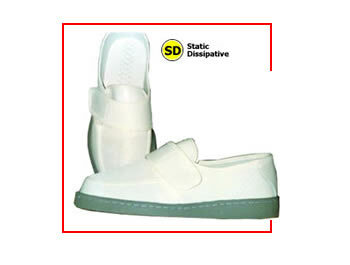 The shoe’s Static Dissipative and Lint free properties also protect clean room environments and we can customize to your requirement on design, special sizes or measurement.